We moved into a 1 bedroom apartment in Mountain View on a three-month lease (not easy to find, some complexes wanted a couple hundred/mo more rent , and most would not lease for less than six months. Alex will be here for about three months; I'll be here now for a little less than two. Being here has made me realize that I take for granted a lot of things that less transient people typically have in their homes. Like cooking utensils. A can opener. Soap. I've also realized that, despite the fact that I consider myself to require very little maintenance, I need a fair amount. I'm unhappy sitting in an empty apartment to be alone with my thoughts. You'd think that being in an environment without the distractions of social interaction, toys, and media would be incredibly conducive to work and dissertation-writing, but the opposite turns out to be the case -- instead of hours of productivity and accomplishment, the empty box leaves me feeling mostly despair. That last sentence was more dramatic than it needed to be. Some people don't have enough to eat or a roof over their head -- further evidence that humans judge by comparison rather than objective assessment. Anyway, my solution to this problem is to try to be out elsewhere as much as possible. The City library (where I am right now) is within walking and biking distance, and is quite nice. I wish I were staying longer so that I'd actually try to settle in rather than just get by or make do. I wish we had a microwave oven, chairs, and stable Internet. I wish I didn't know that our L.A. subletter didn't have it so much better than I do. But maybe he wishes our place had a pool. I have been a Smith for several months now, having jumped through the appropriate hoops (stood in the right lines, filled out the correct forms) to undergo a legal name change. Most things have now been switched over; a stray account here or there, and all of my school stuff remains under my old last name. Before and after I went through the name change, friends of mine asked if I was planning to change, what I'd change to, and afterward, why I had decided to make the change. My main answer has been that I thought I felt pretty neutral about the whole thing, and I thought it would increase Alex's happiness by some small amount, so I changed my name. I realized that a new last name involved some administrative hassles, the name would take some getting used to, might change my sense of self-identity established over the last twenty-six years. Also, it would make some things easier -- e.g., recognition of us as a family unit, which would make things easier once we have kids. What I didn't spend nearly so much time thinking about is the fact that I don't look like a Smith at all. This was made most salient to me when I went to check out a book at a public library in Los Angeles, and the (black) man behind the counter said, "Now how did somebody like you get a last name like Smith?" I told him that I had become a Smith by marriage, and he nodded with understanding. Handing customers their receipts, checkout clerks at Safeway / Vons / Pavilions grocery stores glance at it briefly before addressing them by name. Both the name of the savings club card owner and the name on the credit card appear on the receipt, so I get either a "Thank you Ms. Smith" or "Have a good day Ms. Chan" depending on which part my checker reads. I could just be overly sensitive or making this up, but each time they address me as Ms. Smith instead of Chan, though I get the sense that I have just presented them with a conundrum or puzzle. "Ah, she must have married a caucasian fellow." "Near-victim of China's one-child policy, adopted and saved by a white, American family." "Identity or credit card theft?!" Today I considered another practical implication of my name change when I went to meet someone selling used Wii games on Craigslist. 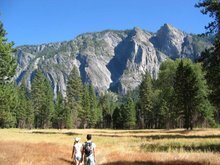 We had communicated via email and she knew me as Smith -- would she recognize me, an Asian female outdoors? And I realized that this is an identity issue that comes with a marital name change that some, but far fewer, individuals will undergo. An increase in interracial marriages accompanied by name changes will prepare store personnel for my arrival and payment. I wonder how long it will take before I'm used to it. 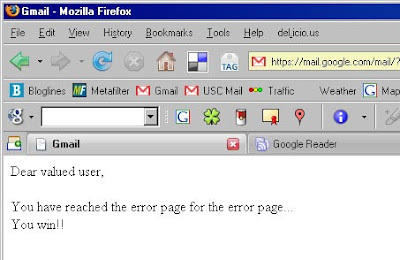 First Gmail said it was taking a while to load and maybe I should try out the HTML version. Yeah it's sort of funny. I hope Alex has fun there this summer. When Elaine and I added her to my checking account at First IB, it took five minutes of paperwork and a 41 cent stamp. When I went to the DMV in order to transfer the title of Elaine's car from her parents to us, it took five minutes of paperwork, and eighteen minutes in line. When Elaine and I went to BofA to add me to her checking account, it took fifty minutes of waiting in line, five minutes of talking to a "banking specialist"*, then the five minutes of paperwork, then five more minutes of talking to the banking specialist, and ultimately resulted in us leaving without accomplishing our goals. The story follows. We walked into the bank on Tuesday, and after learning that we couldn't alter accounts by talking to a teller, we sat down in the plush chairs to wait for the single banking specialist at work that day. They had a giant open building and a small basket of lollipops in a manner reminiscent of visits to the doctor's. We were shortly greeted by a greeter, who's job it was to take down our name and our reason for wanting to speak with the banking specialist. During the momentary break between clients, she would approach the specialist and tell her why the next people were there. This was an important job, as by the time clients were allowed to see her, they had generally forgotten why they had visited Bank of America that day, and often why they had an account with Bank of America at all. After waiting for what not only seemed back was actually measured to be upwards of fifty minutes, our turn arrived. Once we had sat in front of the banking specialist, she explained ... very ... slowly ... that I would need not only one, but *gasp* two forms of ID, and that I would need to know my social security number. Since a major credit card apparently counts as a second form of identification these days, we were apparently over prepared with my passport. After another period of waiting, the woman produced a form for us to sign, that they might have our signatures on file. More questions, offers of new services, and painfully slow explanations later, we arrived at a problem. Elaine's mother was already a joint account holder. Did we want to open a new account? "No." After an hour of waiting, after long discussions of the lack of necessity for brick and mortar banks, and after plans to imminently close the account Elaine had, we didn't want another. "Are you sure you want him on your account? Then either one of you could just take all the money." "So either one of the joint account holders can just close the account?" "And could we do this just be talking to a teller?" At this point, it felt like we'd found kryptonite. If we can simply close the account, and open another one at a better bank, we have no intention of going through the hassle of getting all the necessary signatures and spell components in order to change the names on the account. At the same time, we still need the account for the time being, since Elaine has direst deposit set up with them; but the clock is ticking. * I decided to only put quotes around banking specialist at its first appearance. The quotes are intended to express my skepticism at the legitimacy of such a term, especially as used in this context. This may not actually be the final post related to gift cards, but I hope it is. Elaine and I dropped by Circuit City today, while waiting for her oil to be changed. Although Circuit City is generally a fine store, this one is a bit lacking. We had originally intended to get either a copy of Guild Wars or a new Wiimote, but our choice of stores had none. On our way out, however, we spotted something we could use: iTunes gift cards. Also noticing Virgin Mobile Top Up cards, we decided to split our original CC gift card down the middle. $50 of iTunes for Elaine, $50 of airtime for Alex (note that Elaine's music benefits Alex, and Alex's airtime benefits Elaine). There's the other side to that great thing about gift cards coin. We were given a bunch of gift cards about eight months ago and still have not managed to use them yet. A couple of them were sold on eBay, and the others we figured we would be able to use. Unfortunately this has not yet been the case. First example: $100 gift card to Circuit City. We do electronics, computing, video games, so it seemed plausible that we would be able to find a good use for the card. But we are always looking for a good bargain, we prefer to buy things used, or we will only buy something new if it is offered on sale at a reasonable discount. We rarely have retail store loyalty. Another example: $20 Barnes and Noble gift card that I've had since Christmas. Definitely an appropriate gift because I regularly purchase books. But I buy them new in stores because used books are just as good. I've been to the bookstore with gift card in hand many times, but have been unable to buy anything at retail price knowing that it's much cheaper (and recycled) online. Luckily, existence of a market for gift cards and certificates makes it so that if I ultimately decide that I'd rather have slightly less cash, I can part with the gift card online. Similarly, if your niece/nephew is that that into the Radio Shack gift card you got them for Christmas, they can barter for a different sort of gift card or trade it for universally-accepted cash. * The value of the gift card may not exceed $500. Also, you are likely to lose 10% of the card's face value + your eBay listing fee. Bankrate.com provides more info about the secondary market for gift cards, including various other venues for swapping and sales. ... is that you can buy them on eBay. 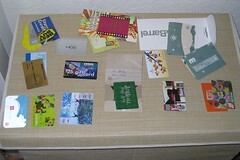 A number of guests at our wedding last October gave us gift cards of varying increments to some restaurants and shops. We have wanted to use them, but because we prefer to buy things used whenever we can, it has been hard to actually consume the gift cards. The other problem is that I've sometimes gone to the store to get something, and realized upon arriving that I should have brought the gift card currently sitting at home. One gift card, the one for The Cheesecake Factory, we knew rightaway that we would not be interested in using. So we looked to see whether it would be feasible to sell them on eBay. Indeed, a massive market of buying and selling gift cards and certificates exists. How can the gift card market help you in your frugality? Buyers -- if you know what store currency you are looking for, you can get the gift card on eBay for up to 20% off face value (10-15% is the norm). Gift cards are most beneficial if you (1) already know the store or restaurant where you will spend money and (2) have the ability to postpone your purchase by a few days or a week. (3) Gift cards may also be beneficial if you shop the same store(s) regularly, i.e., you don't have to worry whether or not you will make future purchases there. For example: I decided that I wanted to purchase several episodes the Bravo show Work Out off of iTunes at $1.99 each. Granted, the truly frugal thing would be to watch it for free or not at all, but we don't have broadcast or cable, and I decided it would be worth the money to me. Instead of immediately purchasing the episodes at full price, I found an iTunes gift card auction on eBay that was about to end. The $15 gift card (which fit the number of episodes I was planning to buy) cost me $13.26 (free electronic shipping), giving me an 11.6% saving for very little of my time, not to mention +1 to my eBay reputation. Another example: Those past a beginner stage of frugal living probably brew their own coffee. Or quit the caffeine habit. But those who have decided that the value of their daily cup of Starbucks is worth more than the monetary cost can purchase a $50 gift card on eBay for $45 and get their month's caffeine at 10% off. Find a better priced auction and increase your savings, but already that's $200 in your pocket if you spend $2000 on coffee a year. Finally: Have a friend whose birthday is coming up in a few weeks? They are into electronics and other stuff, so you figure you will get them a Best Buy gift card (Whether or not gift cards make good gifts is debate that will be left for another day -- I come from a Chinese cultural background and have no qualms giving cash). By buying the card on eBay, you pay less for the gift card, and they can still purchase the same amount of stuff. If their birthday is tomorrow, or TODAY, this may limit your options somewhat. But fortune favors those who plan ahead. N.B. As with all eBay transactions, use good sense before you bid. 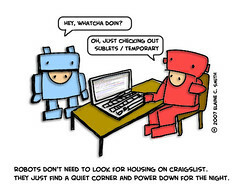 Check out the seller's reputation, types of goods they typically sell, and feedback comments from buyers. If you have any questions about the items, definitely ask. Originally uploaded by eraine. How do I make this bigger? I've been spending a lot of time on Craigslist these days. 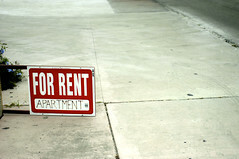 Initially, a large part of it was needing to find a subletter to take over our 1-bedroom for a couple of months in L.A. Looking for a subletter reminded me of the setup on The Bachelor (rather surprisingly, we watched every single episode this season). The Bachelor's stated goal is to find the woman whom he feels best fits him in terms of personality, attraction, life goals, etc, but whom he also believes to feel the same way about him. He is supposed to be looking for a long-term relationship, so he wants a woman who would also be interested long-term. But there is a large degree of uncertainty and reliance upon trust. He dates multiple (though their numbers decrease through the course of the season) women and wants all of them to be interested in him, but in the end he can only pick one. The women, on the other hand, have similar incentives to demonstrate their interest, because if they aren't interested at all, they become easy targets for elimination. Our situation is this: We want to have the best subletter possible. For our situation, that's a clean, responsible, respectful individual (or couple) who wants to rent the apartment for the two months in which it will be vacant. We want a guarantee of the subletter's commitment long-term. That is, we want to ensure that they will not rent for one month, then skip out, leaving us having to scramble for a second subletter or leaving the apartment not paid for and empty. We are choosing between multiple candidates, all of whom indicate interest by responding to our CL ad, and they are looking for other possible living situations because our choosing them is far from assured. Now that we've found someone, there's this issue of figuring out where we will live in the Bay Area, and whether I'll find something (e.g., my job) besides my own thing (academic research) to do. I can't wait until we're more settled. Regular housing searches are not much fun. Speaking of pesticide-filled produce, yesterday I was shucking some corn (that sounds silly, really I was just removing the husks) for boiling, when I suddenly screamed and threw the corn to the kitchen floor. Alex was in the other room, but he correctly guessed that I had encountered some sort of bug. On one corner of the ear of corn was a slowly wriggling caterpillar, which appeared to have eaten a good square inch and a half of kernels. This wasn't the first time I'd let out a yelp while cleaning vegetables. Since we've started eating organic, various bug-like creatures have shown up inside lettuce, celery, and other things from time to time. I'm not afraid of them, but I do scream out of surprise. Despite the fact that they've appeared several times, I still don't expect to encounter worms or bugs. But as much as I'd rather have vegetables without living things in them, it seems like a good sign that our organic produce is able to house the things that should naturally be found in it. Peanuts not fancy, not deluxe. 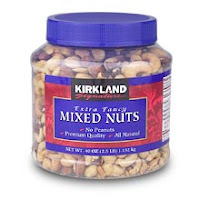 Yesterday at Costco I bought a container of Kirkland's (the Costco brand) Extra Fancy Mixed Nuts. It is a big thing of nuts, I tell you. But I am confident that we will be able to consume it, because we are a nut-eating household. A bit strange to me that pecans ended up as the favorite on the list. I think it may be because I rarely have any. Anyway, like many "fancy" or "deluxe" nut mixes, this one does not contain peanuts. But it doesn't advertise "NO PEANUTS" on the label. This causes me to think more highly of these Extra Fancy mixed nuts. Some other nut mixes find it necessary to proclaim their lack of peanuts or low peanut content loudly. But what is up with not including peanuts? Peanuts are supposed to be a cheaper sort of nut, but by how much? Looking at these wholesale prices, a fair amount. Almonds are $3.75/lb, Cashews $3.70 - $4.00/lb depending on the size. Pecans are $5.50-$5.70/lb, the high end being if you purchase them roasted. Elsewhere, Brazil nuts are $5.59/lb, Filberts for $4.99, etc. Peanuts are an inexpensive $1.40/lb. Are peanuts any less tasty? Do they not have as many nutritional benefits as these other Fancy nuts? Or would a mix with peanuts included just seem not as deluxe? My brother sent me the a link to FoodNews from the Environmental Working Group, which puts out a shopper's guide of the pesticide content found on fruits and vegetables. I had seen a similar list elsewhere -- pesticide-rich produce items -- having first heard of 'the dirty dozen' on a radio show podcast I listen to (KCRW's Good Food). This list actually lists peaches as #1 worst when it comes to pesticides, whereas the list I had seen previously had found apples to be the worst (so I remembered). On the last one I saw, they took their samples based on how people typically eat the fruit -- that is, for oranges, they'd peel the orange and take their measurements from the orange innards. For peaches, which are usually eaten whole, they'd take the measurements with the skin as well. Fruits and vegetables scoring really high (bad) on their list are largely things we eat whole (apples, peaches, nectarines, cherries, bell peppers, etc. ), whereas the things that they find fewer pesticides on, or less % likelihood of pesticides on, are the ones that get peeled (papaya, mango, kiwi, pineapple, avocado, corn, onions..). Lucky for us fans, blueberries are one of the few exceptions. This would seem to indicate that my mom has probably been right all these years in peeling apples and other fruit skins off before serving them at our family's fruit time. Also, it makes me wonder about whether my cousin-in-law Krish is ingesting a lot more pesticides than the average person (he eats most fruits whole, like, oranges with the peel! ), and whether it's not so great that Alex and I have become lazy and started eating kiwi in their entirety, brown fuzz and all.